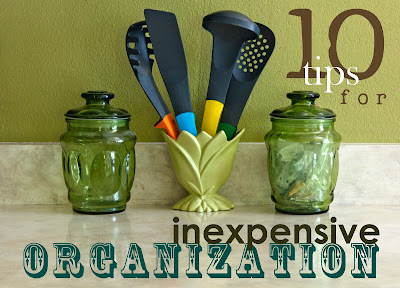 Organizing is about your life, not about how much money you spend (obvious, but it took me a little while to learn. I love pretty, fresh school supplies, um, I think I've mentioned my love of pretty containers, I love pretty interior design--all that generally costs money--even though I try to manage to spend as little money as possible). I used to want it to be pretty and perfect or not at all. It doesn't work that way. It can be pretty later. Right now, it just needs to be organized. In fact, it's better to see if what you come up with works, then buy whatever pretty things to put it in. That way you're not investing a money in a system that won't work for you in the long run anyway. Don't get caught up trying to create the perfect system. Very related to #1. Trying to make the perfect system generally has the effect of making me want to spend $. No system is perfect, but there are systems that work. Like I've said before, if you see a problem, think about how to fix it. Sometimes it's as easy as providing a trash can in the right spot, grouping the right things together, or moving something so that you have easier access. And sometimes it's just accepting that you have to change your habits (hard!). Get rid of stuff. Less to organize! I recently made a goal to get rid of 100 things. This is something I plan to do regularly. Along with that, don't buy new things. I recently read that if you are contemplating buying a (non-perishable) item, put it on a list and wait a designated period of time: two weeks, a month, whatever. If at the end of that time, you still want/need it, buy it. * I find delayed gratification so hard, but it does help a lot with clutter. Use "trash" to organize. ** Food comes in great containers. If all you have are oatmeal containers, cardboard boxes from cereal boxes, fruit snacks, peanut butter jars, strawberry baskets, mayonnaise jars, peanut containers, empty spice jars, even boxes of soda, then use those. There are lots of ways to dress them up, if you want. *** Baby wipe containers are also quite amazing--ask friends if you don't buy wipes yourself. I've seen great things done with paper towel rolls--and toilet paper rolls, but that grosses some people out. Use what you have already. **** You've probably bought baskets or plastic containers already. As you organize, you'll find you get rid of things (see #3) or find new systems. A lot of shifting will occur and you can reuse those old containers. To help with costs, go second-hand. Thrift stores and garage sales can be great for finding containers (the flower vase in the picture came from a garage sale). Canning jars are often easy to find and make pretty good storage containers; also, muffin tins. Sites like Craig's list can be great sources for free cardboard boxes people are looking to ditch after they move. This can work great for some things (the free section even has furniture if you are looking for bigger storage solutions--it doesn't have to be pretty--think basement or garage and hide it--and even if it's ugly for a while, if it's free, you won't feel like you wasted money by buying a cheap temporary option). Even cups or bowls you don't use much can make great storage containers. Hit up your friends. Trade around. Find an organizing buddy and see if you might have things they can you use and vice versa. When I told my friend Natalie about my project, she said she might have some things I could use--funnily enough, I just realized she gave me those jars that appear in the picture above! Make your own storage. ***** There are great tutorials out there for sewing your own fabric boxes, and if you use fabric you already have on hand, it doesn't have to be too much out of pocket. Or use the $4 bed sheets from Walmart for the fabric to get a more uniform look. I've even seen sturdy baskets woven out of paper. Make your own cleaning supplies. This isn't really about organization, but it will save you tons of money, and when things are clean, you want to keep them organized. There are a few products that I really love that I still buy, but for tons of things, I make my own. There are dozen of recipes out there, and I will probably do a post on my favorites at some point. *This also works great for children. We've started this with our kids. If they ask us for something, we tell them to put it on their list. Then they can prioritize it and start saving for the things they really want. Even things as small as candy can go on the list. We haven't ever had much of a problem with begging (sometimes for the small things), but this has pretty much completely eliminated it. Our oldest son really, really wants a board game, and he is saving up for it. It's not a cheap one, and he is about 1/5 of the way there. It's helping him a lot to put things on his list and realize that he still wants the board game most of all. Also don't forget sources like freecycle and craig's list. Freecycle is a list where people in your area post things they no longer want or need rather than putting them in a landfill (also you can give others things you no longer want or need) and Craig's list has a barter section and a free section where you can either obtain free items or again get rid of things you no longer use as a barter trade or just free.